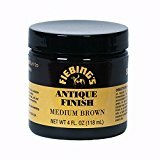 Refined, antiqued finish is the perfect accent to your project after hours of painstaking Carving, tooling and stamping Easily and attractively antiques your favorite leathercrafts Imparts a two-toned patina and blends for special shades Wipe in a circular motion and Remove excess immediately; clear the Raised areas and leave paste in the recessed areas Brings out hand tooling and embossing effects with a rich luster Popular with professional leatherworker, this finish beautifully highlights hand tooling and embossing. Allow to dry and buff. If too thick, we recommend using fiebings tan Kote to dilute; a mixture that includes 30% - 40% tan Kote provides the best results. Product is smooth to apply and easy to clean up. Works great with all our leather projects, and the color is exactly as described. It's Feibings, and it got shipped quick! Can't ask for better than that!